Typical symptoms; Pain at the top of the arm with overhead activities, combing and brushing your hair, lifting your arm up to the side. Your rotator cuff in your shoulder is comprised of four muscles. Each muscle originates on the shoulder blade, or scapula, and inserts on your arm bone, or humerus. 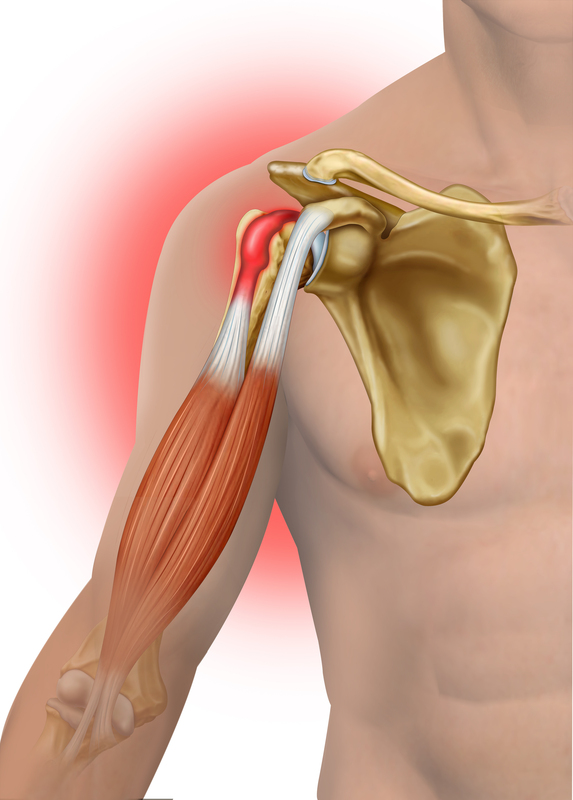 These individual muscles coalesce together at the shoulder to comprise a thick “cuff” over the joint. It is worth pointing out that most muscular issues occur in the tendinous portion of the muscle as the muscle coalesces from muscle to tendinous tissue (this is called the musculotendinous junction) or often in the actual tendon itself. Rotator cuff issues are therefore also covered in part in the section ‘Tendon Problems in the Shoulder’. The rotator cuff has the important job of stabilising the shoulder as well as elevating and rotating the arm. Essentially the shoulder joint socket itself is very shallow and small in circumference compared to the size of the ball joint on the end of your arm bone that it receives. A good simile would be a golf ball that sits on a small tee! The rotor cuff is important as it straps the golf ball on the tee, centralising it and keeping it secure!!! This allows freedom of movement and makes the shoulder the most mobile in your body. If you have suffered an injury to your rotator cuff, you may experience pain or weakness when lifting your arm. 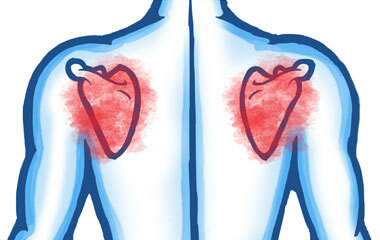 The pain is usually over the deltoid region (on the outside of your upper arm). 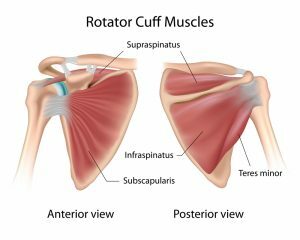 Typically, rotator cuff injuries may cause difficulty with basic functional tasks like lifting, reaching, or sleeping. Supraspinatus: The supraspinatus muscle comes from above the shoulder blade (or scapula) and inserts on the top of the arm bone (or humerus). The supraspinatus helps lift your arm and elevate it to the side. Infraspinatus: The infraspinatus muscle originates below the shoulder blade (or scapula), in the infraspinatus fossa, and it inserts on the back of the top of the humerus. This muscle rotates the shoulder joint outwards. Teres Minor: The teres minor muscle originates from the side of the shoulder blade and inserts at the top of the humerus. The teres minor muscle rotates the shoulder joint outwards. Subscapularis: The subscapularis muscle originates on the inside surface of the shoulder blade, sitting directly over the ribs, and inserts on the top of the arm bone. The subscapularis muscle works to depress the head of the humerus allowing it to move freely in the glenohumeral joint while you lift your arm. Biceps muscle damage is relatively frequent. Their tendons can also tear and rupture in which case the muscle retracts. The shoulder blade (or scapula) is considered to part of the shoulder joint. In fact the socket that receives the upper arm bone (the humerus) is part of the shoulder blade itself. The scapula (apart from one tiny little joint called the acromioclavicular joint) does not attach to the skeleton and exists in a muscular sling that serves to encapsulate it. These muscles have a major role in fixing your shoulder blade in a position that leaves you free to move your arm and undertake tasks. These tasks can be anything such as lifting weights in the gym (this is a common source of injury) or hours spent on a keyboard and using a mouse (like I am now!!). Whether through repetitive strain or heavy lifting, these fixators can be injured (often the rhomboids, or trapezius of latissimus dorsi). As with all muscle related issues there is a grading system for injury. There will generally be minimal, or no swelling and you will be able to lift arm with little discomfort in the case of Grade 1 strain. Grade II strains are the next level of severity and generate more pain. There will be mild or moderate swelling and movement will be painful when reaching of lifting your arm. Grade III strains are the most severe. Patients typically have severe pain and dysfunction. A change in position of the shoulder blade through injury to an important muscle group causes dysfunction in the shoulder and leads to limitation on movement and possible pain. 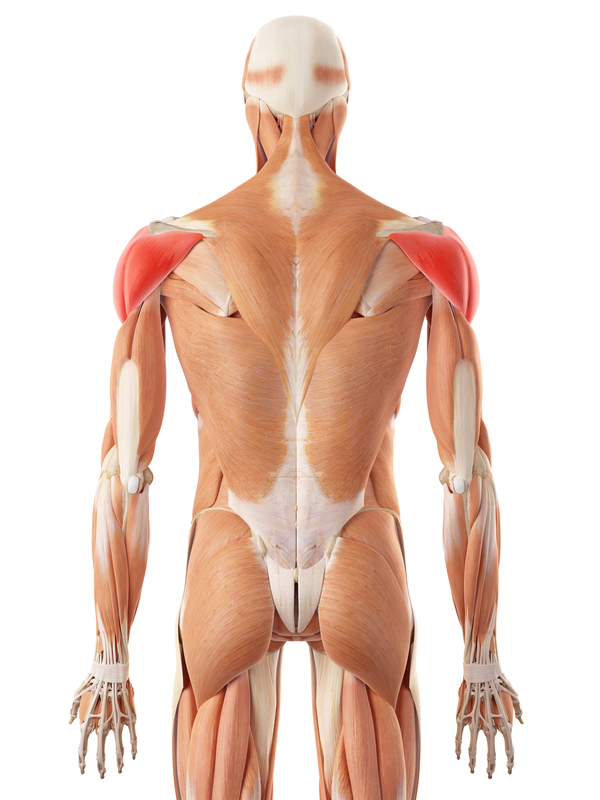 The most important muscles include the rhomboids (on the inside of the scapula closest to the spine). 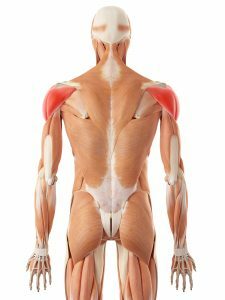 Weakness in the rhomboids, trapezius and latissimus doors combined with another muscle called serratus anterior, can to shoulder blade displacement (or winging). The pectoral muscle comprises two muscles called pectorals major and minor. As most of us know these are the main muscles across the front of the chest and are commonly known as the ‘pecs’. The pectorals are predominantly used to control and coordinate movement of the arm, with the contractions of the pectoralis major pulling on the humerus (or arm) to control various movements such as lifting and rotating your arm. The pectorals also play a part in deep breathing, pulling the ribcage to create room for the lungs to expand. 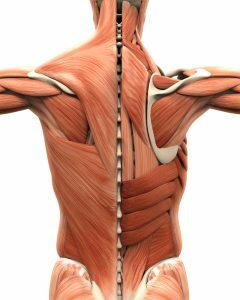 Six separate sets of muscle fibre have been identified within the pectoralis major muscle alone, allowing the nervous system portions of the muscle independently. Injuries to the pectoralis major can occur during weightlifting, as well as other daily tasks that place excessive strain on the shoulders and chest. A pectoral strain typically occurs when pushing a heavy object away from your chest as in a ‘bench press’. Pain is usually felt at the front of the armpit and it can radiate across the chest that worsens as you move your arm with possible swelling and bruising depending on the extent of your injury. Injury is graded into three grades. There will generally be minimal, or no swelling and you will be able to lift arm with little discomfort for a Grade 1 strain. Grade II strains are the next level of severity and generate more pain. You may have difficulty lifting and moving your arm and breathing deeply may painful. There will be mild or moderate swelling. Grade III strains are the most severe. Patients typically have severe pain and dysfunction. They are not able to use their arm for activities and will have moderate to severe swelling. There are other conditions which can mimic pectoral muscle damage but generally the point of onset makes this fairly obvious. Typical symptoms; pain at the front of the shoulder when raising the arm sideways to the side. The deltoids muscle group is at the top of the arm at the arm and is divided into three different portions, or heads, the anterior (front), middle, and posterior (back) portions of the deltoid. The muscle group is very important for lifting your arm up sideways. As with all muscle related issues there is a grading system for injury. There will generally be minimal, or no swelling and you will be able to lift arm with little discomfort for a Grade 1 strain. Grade II strains are the next level of severity and generate more pain. They may have difficulty doing push-ups or lifting their arm. There will be mild or moderate swelling. Grade III strains are the most severe. Patients typically have severe pain and dysfunction in their arm. They are not able to use their arm for activities and will have moderate to severe swelling. It is important to mention that there are many injuries in the shoulder that can mimic a deltoid strain. These can be difficult to distinguish one from the other shoulder issues so diagnosis at the clinic is important. Some other things that can be injured that mimic deltoid pain are the rotator cuff, glenoid labrum, biceps tendon and acromioclavicular joint (AC joint). Muscle weakness and wasting in the arm and shoulder can also be caused by nerve related issues. 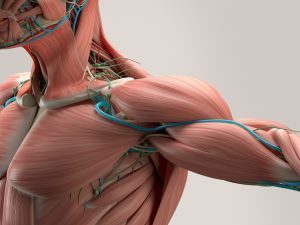 All the nerves that supply the muscles in the arm and shoulder originate from the neck. 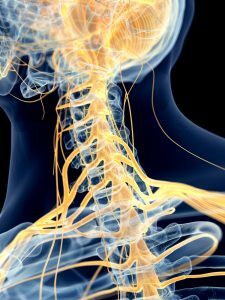 These nerves can be impinged by structures in the neck (discs and bony structures called osteophytes) and these are detailed in the section ‘Trapped nerves in the Neck’ in the ‘Neck and Upper Back Pain’ Section. As seen below the nerves that supply the arm and shoulder are very complex. These nerves bundles are collectively known as the brachial plexus. Other issues affecting the nerve supply to our upper limb, or brachial plexus, can be a viruses or trauma. In the case of viruses, although not a well understood mechanism, the brachial plexus becomes acutely inflamed and when this pain subsides, your shoulder may be weak, limiting your movement. This is a rare disorder that often begins suddenly, with pain frequently beginning during the night. Brachial neuritis is also called neuralgic amyotrophy or Parsonage-Turner syndrome. This condition can leave you with muscle wasting which can affect individual muscles or several.